On November 3rd, 361 ACE, Flavius Claudius Iulianus, also known as Julian the Philosopher or Julian the Great, was crowned Sole Augustus of the Roman Empire. His rule was marked by reforms that touched on and improved administration, economics, and even human rights, but also, rather remarkably, a restoration of Hellenism as the state religion. This was, however, no simple restoration of classical Hellenism; but a full reformation of the faith that would allow the faith to more than likely to succeed the test of time had he survived the war against Persia and had a fuller life to reign that would allow him to appoint successors. This reform had centralized Hellenism with a formal priesthood with strict hierarchy under a single leader, universal charity, and adoption of Iamblichean Platonism as the driving philosophy behind the religion of Rome. Although there were already priests in Roman society, strict hierarchical order or organizational coherence was minimal at best. Much of Julian’s priesthood was built on pre-existing well-established networks of provincial priesthoods that were inherited from Antiquity, but with the aim to create a much more unified hierarchy. Being a member of the priesthood was often a mere part-time occupation, and even what may be considered the most important office, the Pontifex Maximus, would often perform his duties alongside his political responsibilities. The office was very traditional to Roman history and went all the way back to the reign of King Numa, but during the Imperial era the Pontifex Maximus merely became one of many titles for the Emperor. Julian, however, intended to change the title of Pontifex Maximus back to a proper religious office. At the very top of the centralized priesthood was the Pontifex Maximus (Archieréa Mégiston), whose sacrifices were effective for all Hellenes. The Pontifex Maximus was in-charge of religious matters as head of the state-endorsed religious organization, and would be the one to appoint provincial High Priests. Under the High Priests were the municipal priests that they had appointed. They served as repositories of divine gnosis, being “the most valuable chattel of the Gods” who would secure divine benevolence through their duties to sacrifice and pray on behalf of all humanity (ep. 89b. 296b–d, 297a). The first thing they were to teach was “reverence towards the Gods” (Flavius Claudius Iulianus Augustus 1962 II, 324) and also the adoration of “not only the images of the Gods, but also their temples and sacred precincts and altars.” (Flavius Claudius Iulianus 1962 II, 315). They were to live a life of piety, and demonstrated by committing hymns to memory (Cha Clifton 2004, 29), praying three times daily, (Chas Clifton 2004, 30) and engaging in philosophical contemplation (Cha Clifton 2004, 29). They also held duties of helping the old, the poor, and the sick, while also providing and managing charity. A large portion of Julian’s attempted reformation of Hellenism was to appoint High Priests for each province, whose primary concern was, first and foremost, furthering Hellenism. In general, the duties of priests were to help the old, the poor and the sick, while they also provided and managed charity. Julian’s reformation of Hellenism introduced an emphasis on the personal piety of the priesthood. Hellenic priests were to shun places of ill-repute. They were expected to lead lives set apart; they and their families should be sedulous in honoring the Gods. 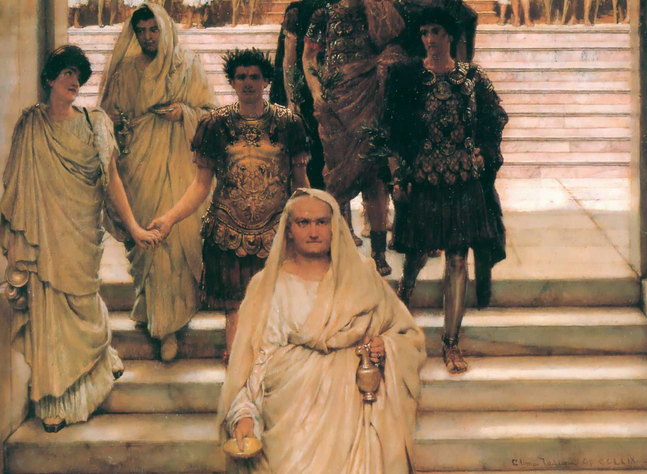 Instead of indulging in the city-life, they were encouraged to withdraw into their temples as no priest was to “enter a theatre or have an actor or a chariot-driver for his friend; and let no dancer or mime even approach his door” (Flavius Claudius Iulianus 1962 II, 335). Priests were expected to organize works of philanthropy, but to be careful to keep their priestly vestments unspotted by the world and to “abstain from too costly dress and from outward show” (Flavius Claudius Iulianus 1962 II, 333). It was a blend of traditional ritual, myth, and belief with the Platonist inner life that the divine philosopher Iamblichus had advocated decades prior. But the fact that Julian stressed inner-devotion rather than prominence in public life as the central qualification for priestly office, is what made this reformation truly differentiate from the priesthood of old; and instead drawing similarities with something such as the Christian church. To Julian, one didn’t have to be an important individual to become a priest. Even the poor could be appointed, provided they were chaste (Nicholson 1994, 2), well-read (Nicholson 1994, 2), and possessed “love for God and love for his fellow men” (Flavius Claudius Iulianus 1962 II, 337). Instead, the importance of inner-devotion and holiness was stressed. Divine favour was sustained with inner devotion and holiness that was demonstrated by on-duty priests, with public value being given to personal virtue. At the temples, priests were to expected to preserve their purity through elaborate policy. They were to be careful not to wear the priestly garments in places where they might be sullied by ritual defilement; the clothes they wore in public were to be simple and non-flashy. They prohibited from entering the city’s more unsavory quarters, such as the wine-shops and theatres (Flavius Claudius Iulianus 1962 II, 335). One of the most striking features of Julian’s priesthood was that the priests were to be distant from politics; as Julian wanted the calling of a priest was to be thought of as holier than the calling of a civil officer. When the governor of Galatia arrived in a city, Julian told Arsacius, the High Priest of Galatia, that no priest was to go out to meet him or call on him in the ceremony of adventus, a ceremony held when a notable official would be formally welcomed by a city (Nicholson 1994, 3). Priests were preferred to maintain contact with officials in writing and receive them in the temple, rather than going to them. In the case a governor or other state official was to visit the temples of the Gods, they would be expected to leave their armed guards outside the temple before they enter, as they had no jurisdiction within a temple. “For you yourself, as you are aware, have authority over what is within, since this is the bidding of the divine ordinance” (Flavius Claudius Iulianus, Letter 22) is what Julian wrote to a High Priest. Only during calmer times were priests allowed to go and talk to officials, to which political officials were expected to rise from their seats in the presence of a priest (Flavius Claudius Iulianus, Letter 18). Julian set about reforms in his administration to introduce a Hellenic universal charity, where provisions would be made available for the needy whether they were a Hellene or not. The job of managing and providing the charity fell to the priests, whose were to make sure that they care for the ill fortunate, helping the old, the poor and the sick while being the ones to manage and provide charity. Distribution of corn was to be given to the ill-fortunate and hostels were to be furnished in every city as a means of forming a chain of confessional caravanserais, readily available for the poor to benefit from Hellenic benevolence. Julian’s reformed variant of Hellenism was, as one would expect, a polytheist religion, but also took on forms of panentheism and monism. Julian’s Hellenism was primarily backed by the philosophy of Platonism, most notably derived from Iamblichus, a Syrian philosopher who lived decades before Julian and had endorsed ritual imitation of the divine as a means of achieving henosis (unity with the divine). Many in Julian’s priesthood were expected to be educated in a variety of approved philosophies, most notably Iamblichean Platonism. A significant aspect of Platonism was that it was a polytheist philosophy, with an insistence on the existence of all Gods, whether as guardian divinities of particular individuals and nations or lesser demiurges who aided the Celestial Demiurge, the Creator of All and King of the Gods, in the creation and maintenance of the universe. There was a need to honor & worship Gods at each level through theurgic ritual practice as a means of achieving henosis. It was on this basis that monotheists, who pushed disbelief in other Gods or merely wrote them off as evil spirits unworthy of worship, were deemed to be atheists; for their subjective and solipsistic denial of divinity. Platonism and other forms of approved philosophy were expected to be learned by priests. For this position, Julian writes “indeed on all accounts philosophy alone will be appropriate for us priests; and of philosophers only those who chose the Gods as guides of their mental discipline, like Pythagoras and Plato and Aristotle, and the school of Chrysippus and Zeno. For we ought not to give heed to them all nor to the doctrines of all, but only to those philosophers and those of their doctrines that make men god-fearing, and teach concerning the Gods, first that they exist, secondly that they concern themselves with the things of this world, and further that they do no injury at all either to mankind or to one another, out of jealousy or envy or enmity” (Flavius Claudius Iulianus 1962 II, 325-327). Julian’s own personal view on Hellenism had a hierarchical pantheon of Gods, with a focus on the three suns. The first sun was Aion, who was Being-In-Itself; whom all took part in their essence. Following Aion was the second sun, Zeus-Helios, the Celestial Demiurge and King of the Gods. Lastly, there was the material sun, who was seen as the body of Helios. There were many levels of existence, each with their own Gods who ruled them. Clifton, Chas S., and Graham Harvey. The Paganism reader. New York: Routledge, 2006. Elm, Susanna. Sons of Hellenism, Fathers of the Church: Emperor Julian, Gregory of Nazianzus, and and the vision of Rome. Berkeley: Univ Of California Press, 2015. Greenwood, David Neal. “Constantinian Influence upon Julians Pagan Church.” The Journal of Ecclesiastical History 68, no. 01 (2017): 1-21. doi:10.1017/s0022046916000609. Murdoch, Adrian. The Last Pagan: Julian the Apostate and the Death of the Ancient World. Rochester, VT: Inner Traditions, 2008. Nicholson, Oliver (1994). The ‘Pagan Churches’ of Maximinus Daia and Julian the Apostate. The Journal of Ecclesiastical History, 45, pp 1-10. 1994.